Now that my Montreal week is over, I can resume my Travel Tuesday series on my German exchange! There are lots of things to do in Berlin, do a walking tour, visit the Reichstag, but another cool thing to add to your list is to visit the Berlin Olympic Stadium! It took us a bit of a long time to decide to head there, but on a not so cold day of January, we set out to explore the famous 1936 stadium. We were studying at an institute within walkable distance of the central u-bahn station Friedrichstrasse, so from the station it was a direct line to the aptly-named station ‘Olympiastadion’. Insider tip: Make sure to take the right train since it’s a line that splits. That was definitely something I needed to get used to when I was staying there! We arrived at the station and only had to cross the little overpass to make it to the stadium. It truly is beautiful! You enter through this super imposing gate and then get to roam around the stadium at your liking. I have no idea how it is at other moments of the year – but we were the only ones in the stadium and it was fun! We got to run and kid around a lot! We took the obligatory bear photo, rented some audio-guides and got to hear about the amazing history of this stadium! For some reason, we had it in our heads that we wanted to run on the grass – well for obvious reasons we weren’t allowed to do that. It was a big disappointment! We almost ran over the fences because there was literally no one around – but we thought that being arrested on foreign soil would not look so great for us. So we suppressed that envy! Before leaving, we stopped by the shop – I bought a few nice football themed gifts for my brother and dad – and we had the funniest encounter with the guys working at the register. We walked around the shop, speaking French to each other ,and when we all came in to pay, the guys were eagerly talking with us. Then they finally had the guts to ask us if we were from ‘Frankreich’ – we all shook our heads and answered ‘Kanada’. They seemed completely clueless that indeed French speakers lived in Canada – we had utterly confused them! We all laughed it off and swore to them that our French was different. I’m sure this happens to people a lot – people who aren’t used to a language will confuse your accent for the accent of a different country, right? 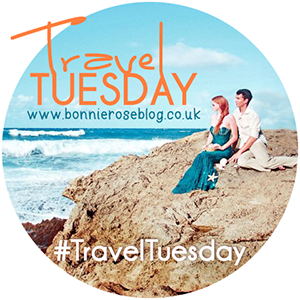 Welcome to the Travel Tuesday linkup! Glad you’ve joined us! Make sure to check out the pages of the other girls: the host Bonnie, and my fellow co-hosts Jessi and Amy. Every week, each of us will be choosing our favourite post from the previous week, so make sure to check out those highlighted posts! For last week, I wanted to highlight the post of Katrina of The Thrifty Gypsy’s Travels. I loved her post about the Roman Forums and Palatine Hills – it was gorgeous and I truly learned something about Rome! 1. SHARE a post about travel! From road trips to trips abroad and from past travels to dream vacations. You can write about travel tips and tricks, favourite places to stay, or anything in between! Just make it about traveling somewhere! 2. GRAB the lovely button above. If you run into trouble, just make sure to mention Bonnie, Jessi, Amy, and Camila in a link! 3. LINKUP goes live every Tuesday at 0800 GMT. Make sure to visit the host and cohosts’ blogs and visit around!